Sweet Sadie's Baking: Caramel Cake with Caramelized Butter Frosting...Sweet and Sinful! 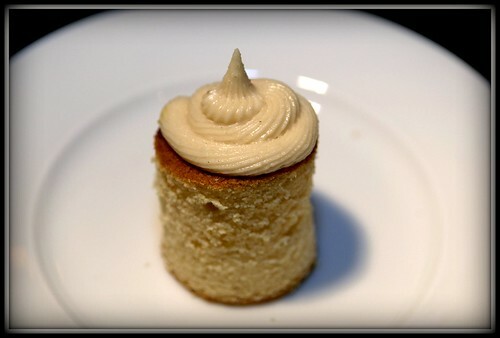 Caramel Cake with Caramelized Butter Frosting...Sweet and Sinful! The star of this months Daring Bakers Challenge is Sugar! There is nothing like sugar and butter, heated together and browned ...what a wonderful couple they are! Forget about calorie counting and low fat ...it's worth it. Dolores of Chronicles of in Culinary Curiosity was our host this month and helping her were co-hosts, Alex of Brownie of the Blondie and Brownie duo and Jenny of Foray into Food . And our alternative baker, once again is Natalie of Gluten-a-Go-Go . The recipe creator is Shuna Fish Lydon of Eggbeater and the challenge is her signature caramel cake with caramelized butter frosting. We were lucky to have Shuna in our virtual kitchen to answer our questions. Thanks Shuna! The recipe looked straight forward until we were directed for further guidance to another website and then the journey began...DANGER!!!!! Sugar can burn your skin badly! To be honest, I usually wear a t-shirt while baking and I don't even think about burning myself...Yes...I have been burned many times, but so was my mom, Sadie, and it just comes with the territory. Those scars are our badges of baking! But reading all the cautionary notes was like a frightening novel, "one should ALWAYS have a bowl of ice water nearby when making caramel, wear long sleeves and USE EXTREME CAUTION. This is a hospital emergency room visit if it gets on you", so as I was about to pour the water into the very, very hot sugar, I caught a glimpse of my bare arms. YIKES! I donned my large oven mitts! There was still a stretch of skin exposed. I threw a sweatshirt on. I am now incredibly hot, trying to hold a measuring cup with one oven mitt hand . Oh yes... a screen over the pan will help when the caramel jumps and sputters ...and where is that bowl full of icewater in case you are hit, so you can dive in so the burn will be minimal? Now I am holding the screen with the other oven mitt and I feel like I should be wearing a mask. This is ridiculous. I can barely hold onto these things without dropping them with these big mitts. My luck I would end up with a broken foot. After all this drama, it sizzled a lot ( like an exciting chemistry experiment) and the cake was very good. Yes ...very good. A lot of the Daring Bakers found the icing too sweet, but I loved the caramel taste and it was a big success with my tasters. You can find the recipe on Shuna's blog. If you try it, please let me know how you made out and seriously...cover up. 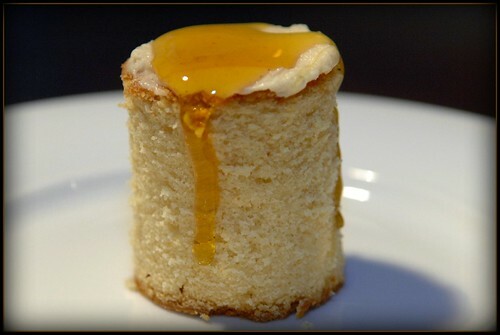 For thousands of other approaches to the Caramel Cake, check out the Daring Bakers Blogroll. Why hasn't anyone designed elegant full length oven mitts? Awww..looks great. I liked how you made it into a petit four. Great presentation. yummy! I laughed out loud reading about your outfit you donned to pour water into your pan. I solve this by using a bigger saucepan than the recipe calls for. That way, no spill, no danger. It was nice to read your entry since you really loved the cake. Me? Not so much. You did a great job. What a lovely cake you made! Great swirl on top too. Arm length oven mitts? You might be on to something! I'll take twelve, PLEASE. Incredible presentation, photography and text. Looking forward to eating them. Would you like my address?? ?